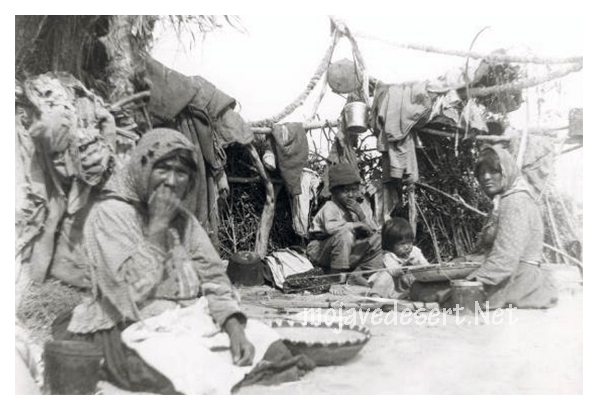 Chemehuevi Indians at Oasis of Mara 189? The Chemehuevis had lived at the Oasis of Mara in Twentynine Palms many times before the 1860s, as had other Indian groups. "Serranos had previously inhabited the area in the 1850s and early 1860s, but when they returned to Twentynine Palms in 1867-1868, they found Chemehuevis living there. When Indian Agent George Dent of the Colorado River Indian Reservation tried in 1867 to get Chemehuevis to move to that reservation, the group that had settled at Twenty-nine Palms refused to go there, being unwilling to place themselves under the control of the government. They wished to preserve their language and religion and "maintain their sacred sites" (1997:69). For some years, it was possible for the Chemehuevis to live in something close to their traditional way at Twentynine Palms, located as it was in a relatively isolated part of the desert. The water at the oasis permitted them to garden, and the surrounding area provided plant foods to gather and good hunting. As non-Indians moved into the area with their livestock, the animals depleted the plant resources provided by the area, which sustained both the Indians and the animals they hunted. Moreover, the invading whites with their guns depleted the animals the Indians depended on for meat. The Chemehuevis were eventually reduced to working for wages and buying processed foods, but the isolated location of Twentynine Palms made it difficult to earn enough for the level of subsistence that would maintain them. They began to die of malnutrition and white man's diseases, although their isolation kept them from contracting smallpox in the epidemic that raged through southern California in 1877 and 1878. The birth rate dropped as mothers became malnourished (Trafzer et al. 1997:69-74). When white families began to claim land in the Twentynine Palms area, they also claimed water rights at the oasis there. The situation became especially desperate for the Indians when the Southern Pacific Railroad Company, which had been granted alternate sections of land on either side of its route in the early 1870s, claimed the water at the oasis, and denied the Indians access to it (Trafzer et al. 1997:74).